The clash between commerce and creativity has always been a constant in the movie business. While writers and directors are interested in maintaining their original vision and intent for their film, producers are more interested in what will fill seats in theatres, and usually these goals are mutually exclusive. As a result, there is usually a tug-of-war over what version of the story the audience sees-- the original vision that is artistically uncompromising in its presentation, or the more commercially-viable vision that may be diametrically-opposed from what was originally intended. In most cases, the studio usually wins, getting its say over the 'final cut' of the film-- James Cameron ("The Abyss", "Terminator 2") and Ridley Scott ("Blade Runner") are two high-profile writer/directors who have endured such indignity. In other cases, the writer or director will stick to their guns and go it alone-- George A. Romero lost his distributor for "Dawn of the Dead" when he was unwilling to make cuts to the film's graphic violence that had earned it a kiss-of-death 'X' rating. Somewhere in the middle between these two extremes, the creative and commercial ends of the spectrum will come to some sort of compromise. In some cases, the two sides work together and meld the best of both worlds-- Sam Raimi's "Army of Darkness" is a great example, as the studio-endorsed theatrical cut exhibits sharper wit and better pacing than Raimi's original cut. However, more often than not, the end result is a namby-pamby mish-mash of conflicting agendas that betrays the film's troubled genesis. "Rules of Engagement" is such a film. James Webb, former Secretary of the Navy and author of the film's original story, had originally demanded that his name be removed from the film, as he felt that a number of scenes in the film's final cut were inconsistent with his original vision. The studio relented and a number of last-minute edits were made to appease Webb. Unfortunately, it is quite obvious from watching the film that in the attempt to be all things to all people, the story got lost in the shuffle and the end result is a half-hearted mix of morality tale and your archetypal Hollywood feel-good courtroom drama. The opening scenes of "Rules of Engagement" are the strongest. The story begins in the jungles of Vietnam in 1968 where Terry L. Childers (Samuel L. Jackson of "Deep Blue Sea") and Hayes Hodges (Tommy Lee Jones of "Double Jeopardy") are serving together. When a North Vietnamese attack catches them unaware, Hodges is injured and pinned down by enemy fire. With few options at his disposal, Childers puts aside his moral compass by shooting a prisoner-of-war, a cold-blooded act that ultimately saves the lives of Hodges and his men. Fast-forward to the present and the careers of Childers and Hodges have turned out quite differently. While Childers has made a life-long career as a decorated Marine, Hodges' career has taken a different turn. Having never recovered from his injuries, Hodges has endured a drinking problem and the break-up of his marriage before finally going back to school and becoming a middle-of-the-road military lawyer. Despite their divergent careers, the two men have remained friends, with Childers making a special point to attend his friend's retirement party. A little later, while on a routine mission to Yemen, the unthinkable happens. While evacuating the US ambassador Morain (Ben Kingsley of "What Planet are You From?") and his wife (Anne Archer of "Clear and Present Danger") from a besieged embassy, Childers' Marine unit comes under hostile fire. Pinned down and with three men already dead, Childers issues an order to his men to return fire. The resulting massacre of 83 civilians escalates into an international incident, as the front pages of newspapers all around the world carry the disturbing images from the aftermath. 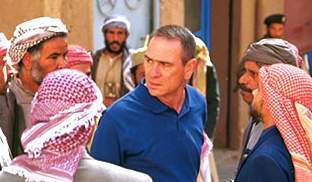 In search of a scapegoat, the US National Security Advisor (Bruce Greenwood, also of "Double Jeopardy") orders that a court martial be held to convict Childers of murder, even though he possess videotape evidence that proves otherwise. Sensing that he is being hung out to dry, Childers approaches Hodges to defend him, a task that Hodges reluctantly accepts. Unfortunately, in addition to the damning evidence against Childers and the hot-shot prosecutor (Guy Pearce of "L.A. 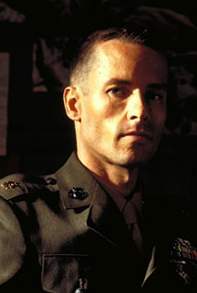 Confidential") brought on board to try the case, Hodges must also contend with the hot-headed and unrepentant demeanor of his client that is hurting his case. The main difficulty I had with the film was how it took a complex issue (the morality of war and the sometimes ambiguous situations arising from it) and watered it down to provide a simple and emotionally-vacuous resolution to the story. At the beginning, the audience is treated to some riveting footage of Childers and his men under fire in the American embassy, almost rivaling the gritty intensity of "Saving Private Ryan", which effectively conveys the danger and fear that permeates the scene. When Childers and his men finally retaliate, it is portrayed as a gross over-reaction to the situation. This sets up the complexity of the story's central issue-- what are the rules of war, and was Childers justified in what he did? As Hodges investigates the case, it becomes readily apparent to both himself and the audience that Childers may indeed have grossly over-reacted in light of the situation. At this point, I had a feeling that a "Practice" moment was imminent, in reference to how every other episode of TV's "The Practice" has a moment where one of the lawyers suddenly has an uneasy feeling that their client is guilty as hell and thus becomes embroiled in a moral dilemma. I sat there thinking that maybe "Rules of Engagement" was actually about Hodges, and the internal conflict raging within him over this case. But alas, this interesting angle was quickly defused when a hostile confrontation between Hodges and Childers dissipates into 'two good ol' boys' laughing it off, and the film ends up taking the safe road by removing any shred of doubt from Hodges' motivation. Another aspect of the film that diminishes the moral complexity of the film is the over-the-top and one-dimensional nature of the film's villain, the National Security Advisor. The audience is shown up front how much a weasel this guy is, and even though we still have doubts about Childers' innocence, our revulsion becomes diverted towards this oily character who suppresses evidence. I can see that the powers that be were trying to improve audience sympathy for Childers with such a move, but it seems more like an attempt to gloss over the film's central issue with a cop-out. As the film's trial gets underway, the film's split personality continues to worsen. Plot points are raised yet never adequately pursued, and the resulting trial scenes are uneventful and unsurprising. The ambassador lies on the stand, and Hodges attempts to convince his wife to act as a rebuttal witness, yet this matter is dropped and quickly forgotten. The same thing happens to the issue of the evidence that the National Security Advisor has suppressed. With no surprise revelations or heart-wrenching dramatic conflict, the film's latter half betrays the promise of the film's first half. And in speaking of the film's ending, it seems that the film ran out of time since many dangling plot threads end up being resolved off-screen and are communicated through the use of captions. Normally, you see this kind of thing in a documentary or in a film based on a real-life incident, as a means of following-up on the real-life players of the story. "Rules of Engagement" is far from a 'based on a true story' type of film, and the use of this last-minute narrative wrap-up is indicative of the lazy storytelling that permeates this film. Performance-wise, Jackson, Jones, and Pearce acquit themselves well, even though the script can't seem to decide what to do with their characters. I found it particularly refreshing to see Jones in a different type of role than we are used to seeing him in. Lately, we have seen Jones doing his "Fugitive" shtick, playing characters that know-it-all and are highly-confident in their ability to 'get their man'-- in this film, his character is a broken man who is unsure of himself and his ability to defend his friend from some serious charges. 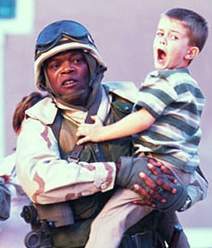 "Rules of Engagement" calls to mind a number of better military dramas, particularly "A Few Good Men". Unfortunately, the scatterbrained approach to storytelling is a serious detriment to the film's emotional impact. 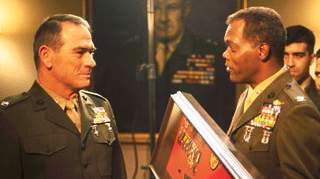 While it may be passable entertainment for those who like the film's mix of combat and courtroom drama, or find Jackson and Jones appealing, the ambiguous take on the subject matter makes "Rules of Engagement" not as engaging as one would expect.